Make your Christmas Baby Shower Table dazzle with a twinkling centre piece and tasty Christmas nibbles. 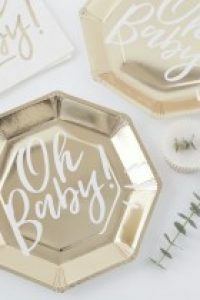 Check out these ideas to make the most eye catching Christmas Baby Shower Table. Make something that people will want to take a picture of! Don’t forget the Christmas Crackers! Spread a beautiful table cloth that goes with your theme. Sprinkle some glitter or confetti all over. Hang some bunting from the ceiling above the table. Put a Christmas Baby Shower Cake in the centre. Try using this ‘Happy Pushing’ decoration in lieu of ‘Happy Christmas’! Flowers that match your theme would be gorgeous. (Try several small arrangements that you can dot around the table!) Why not add candy canes to these small bouquets?! Make them extra festive! Baby Shower Christmas cookies are a must! Check out this scrumptious recipe here! Some sparkling Baby Shower Christmas Mocktails in some cute champagne flutes. Steaming mugs of hot apple cider or hot chocolate! 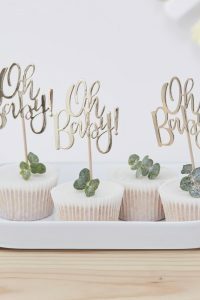 These decorations would make adorable place names! 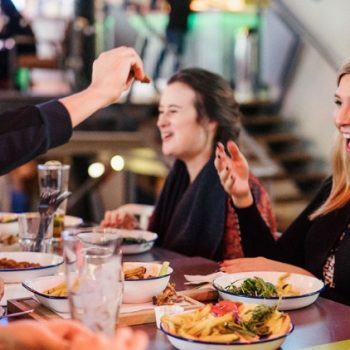 Especially if you are planning a seated meal! 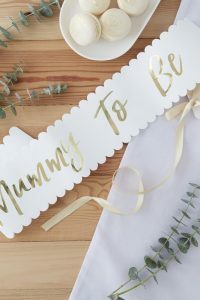 Pop a decoration that says ‘Godmother’ onto her plate. Fill the glass next to it with her favourite drink! It will be a great way to get everyone settled. Finish off with a few twinkling candles! Your Christmas Baby Shower Table will be the glowing centre of the party! After the mum-to-be, of course!